Bad weather frequently comes from out of nowhere and will usually leave a path of destruction. The unpredictable blowing of branches, rocks and debris can bring cracked or broken windows to cars, trucks, RVs and buses. When the weather subsides, PG Reseda auto glass repair can arrive with mobile trucks to survey the damage and provide an accurate estimate on the total cost of the restoration. The prompt arrival of trained technicians reduces the downtime associated with a vehicle that cannot be used due to glass damage. The constant construction that is performed on neighborhood streets can increase damage to motor vehicle windows. The constant stopping and going of traffic increases front and rear collisions that seem to always break or damage windows. The mobile trucks used by PG Reseda auto glass repair technicians eliminate the need to travel to a repair facility after damage happens. The technicians arrive quickly to restore cracks or replace a busted window. Residents deserve a reliable partner for same day and emergency auto glass service. The automobiles that are manufactured in modern society are more fuel efficient and constructed to withstand wear and tear for many years. There are many types of safety glass available and current automobile manufacturing companies conduct testing to keep drivers safe. This testing cannot predict the actual damage that occurs when accidents happen. PG Reseda auto glass repair specialists have experience with every type of collision that can occur with an automobile window. Every window is repaired with a high level of professional accuracy to ensure driver safety. Families that use an RV depend on the safety and security that the specially manufactured windows provide. A sudden impact from a collision or vandalism can destroy these protective windows. A broken windshield or window that happens while traveling can leave any driver feeling helpless and alone. PG Reseda car window replacement specialists know the importance of responding promptly to driver requests to examine the damage and restore a broken or cracked window to like new condition. PG Auto Glass is your mobile auto glass partner during emergencies. In case of an accident, it is common that an auto glass is broken or damaged. Our mobile vans for auto glass replacement in Reseda can arrive at the scene of the accident and replace the damaged glass with a brand new one. If the damage is minor and can be repaired, our technicians for auto glass repair in Reseda will repair the damage and get you back on the road in no time. Do you live in Reseda, CA in zip codes 91335 or 91337 and need prompt services for repairing or replacing your auto glass? 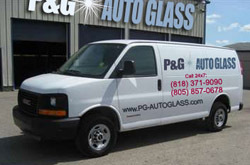 Contact PG Auto Glass and have your glass repaired as soon as possible.